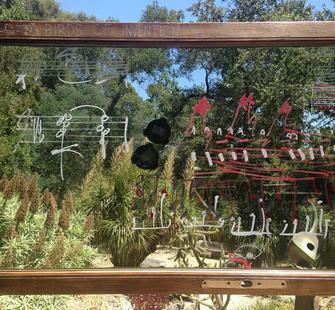 With Birds of Invention: A Garden Opera, Livingston presents a unique sonic menagerie of invented birds located in Montalvo’s Italianate Garden. After recording the dawn chorus at Montalvo, Livingston used a software algorithm for audio detection to extract the rhythms of the birds native to the site. Livingston mapped alternative sound samples, including identifiable local soundmarks that reference the region’s history, ecosystem and vital cultural voices, onto the extracted rhythms to create new invented birdsong. The work is presented using audio transducers mounted on resonant plates inside ornamental birdcages. Some of the birdcages are interactive, with microphones that listen to and imitate the sounds of visitors. At a workshop held after the exhibition opening in August (date to be announced soon), visitors are invited to explore the principles of bird communication and use deep listening techniques to identify found sounds they can use to invent their own bird song. These new birdsongs will be added to Livingston's menagerie.